Enjoy our fun lemon facts for kids. Learn a range of interesting information about everything from the origins of the lemon to popular varieties. Whats the heaviest lemon ever grown? What countries produce the most lemons? Answer these questions and much more with our fun lemon facts for kids! 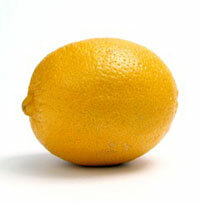 The lemon is native to Asia, around Northeast India, North Burma, and China. Lemons are believed to be a hybrid between a sour orange and a citron. The lemon is an evergreen tree, it blooms (a white flower) and produces fruit all year round. Each tree can produce between 500 and 600 pounds (225kgs and 270kgs) of lemons a year. Christopher Columbus took lemon seeds with him to the America's in 1493, introducing the fruit there. Lemons have a sour taste to them, this is due to the fact that lemon juice contains about 5-6% citric acid. Lemon juice is the main ingredient of lemonade. The sour taste of the juice also makes it ideal for squeezing on fish, while slices of lemon or lemon rind are used as a garnish for many other foods and drinks. Lemon zest (grated outer rind) is used for flavor in baking of cakes, sponges and biscuits, puddings like lemon meringue pie, rice and other dishes. Even the leaves of a lemon tree can be used to make tea and in the preparation of cooked meats and seafoods. Due to its high acidic nature the juice of a lemon can be used for cleaning. Lemon halves dipped in salt or baking powder can be used to brighten up copper and clean kitchenware. An experiment that involves attaching electrodes to a lemon can create a battery that produces electricity. Several lemon batteries can power a small digital watch. The top 5 producers of lemons in the world each year, in no particular order, are China, India, Mexico, Argentina and Brazil. Because lemons are high in vitamin C they can prevent the disease scurvy which was common among sailors stuck on ships for months. Even today, the British Navy requires ships to carry enough lemons so that every sailor can have one ounce of juice a day. The demand for lemons and their scurvy-preventing abilities hit a peak in the California Gold Rush of 1849. Malnourished miners were willing to pay a lot for a single lemon. Today, California is still full of lemon trees as a result. Common varieties of lemon include Meyer, Eureka, and Lisbon. In 2003, the heaviest lemon ever grown was recorded in Kefar Zeitim, Israel. It weighed 5.265 kg (11 lb 9.7 oz), had a circumference of 74 cm (29 in) and was 35 cm (13.7 in) high. Guinness World Records 2013.